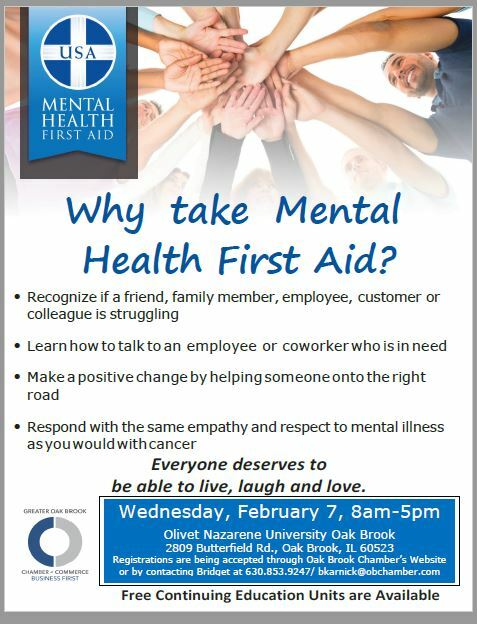 Drink a Glass – or Two – for a Great Cause! 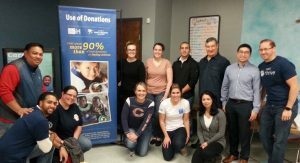 Join the Oak Brook Park District Foundation for a fun evening supporting a great cause! 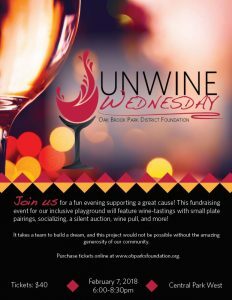 On Wednesday, February 7, 2018, the Foundation will be hosting an Unwine Wednesday fundraiser to build an all-inclusive, universal playground in Oak Brook’s Central Park! This one of a kind playground will remove both physical and social barriers so ALL individuals, with or without disabilities or critical illnesses, can play side by side with their peers and families. It will feature many innovative pieces of equipment including a dual track zip line, a poured in place surface baseball diamond, and two levels of play that will be fully accessible through ramping. Play is a critical part of the social, emotional, cognitive and physical development of every child as well as essential to developing cross-generational bonds. Their goal is to ensure no one is left on the sidelines. It takes a team to build a dream, and this project would not be possible without the amazing generosity of the community. Thank you to event sponsors Karl and Gayle Maurer and La Barra Ristorante as well as raffle sponsor RealtyOne & Associates – Megan Johnson and Alyssa Pisarski. For more information on the entire project, visit www.UniversalPlayground.org. Tax legislation has far reaching implications. It is critical that we identify and analyze the effects of tax reform proposals on Portfolio Diversifying Investments (PDIs) and chart an effective advocacy course. This call featuring Board Co-Chairman Dan Wagner focuses on the proposed tax package and discuss the overarching goal of tax reform. 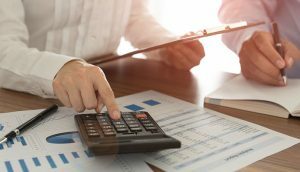 In addition to providing context for tax reform the call examines some of the aspects that may affect IPA members and how our industry can effectively advocate around these issues. Award Nomination Time is Now! 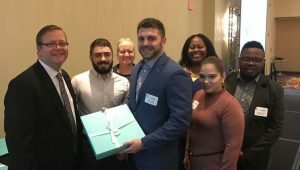 The model workplace award is given to the organization of 50 or fewer employees that has created a dynamic and unique workplace culture that attracts and retains talent and develops future business leaders. Do you know a company that would be a great nominee for this award? In 2018 the Chamber will present TWO awards based upon number of employees. Please click here to nominate a chamber member company for this award or contact Tamryn Hennessy with any questions. In March, the Chamber recognized Tidal Commerce as the recipient of the Model Workplace Award. Tidal Commerce, a family owned credit card services provider, promotes the ultimate alignment of mission and corporate culture, treating both their clients and their employees with the utmost respect in an industry not known to do so. Owners Drew and Angie Sementa attract and retain their loyal team through programming and benefits including 100% health insurance, consistent recognition of employees’ personal milestones, weekly lunch celebrations, quarterly outings, and robust community service opportunities. 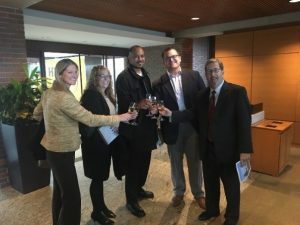 Mark Spirek, the CMO for Tidal Commerce said “winning the Model Workplace award from the Greater Oak Brook Chamber of Commerce has been an honor for our team. It is a great symbol of our commitment to our values of transparency, diversity, and community engagement that we strive for everyday”. Congratulations again, Tidal Commerce, keep up the good work! Rush Oak Brook Orthopedic Center – Coming Fall 2018! Rush University Medical Center and Midwest Orthopaedics at Rush are expanding access to academic health care with a new, state-of-the-art professional building and surgery center in Oak Brook, IL. The approximately 100,000-square-foot professional building, to be located at 2011 York Road in Oak Brook, will house an outpatient surgery center, offices for Midwest Orthopaedics at Rush, and offices for other faculty physicians from Rush University Medical Center. Additionally, the building will include imaging and laboratory services. The project is a 50/50 joint venture between Rush and Midwest Orthopaedics at Rush. The total cost of the new building is estimated to be about $65 million. The state-of-the-art outpatient surgery center is estimated to cost $21 million. An attached parking deck, to contain about 485 spaces, is part of the plan. Illinois REALTOR® Dan Wagner was honored with the National Association of REALTORS® Commercial Award for his work on behalf of the real estate industry in Chicago on Nov. 5, 2017. Wagner, who is president-elect of Illinois REALTORS® and senior vice president of government relations for the Oak Brook-based Inland Real Estate Group of Companies, was saluted for his work to promote best practices in the industry and efforts to preserve the 1031 Like-Kind Exchange as part of the nation’s tax code. He served as the 2016 Commercial Liaison for the National Association of REALTORS® (NAR). The award was given at NAR’s Conference & Expo held in Chicago, Nov. 2-6, 2017. The award is the latest recognition of Wagner’s leadership in the industry. He served as president of the Chicago Association of REALTORS® and was named that association’s 2017 REALTOR® of the Year. He’s served on numerous REALTOR® association committees at the local, state and national levels. Wagner is a commissioner on the DuPage Airport Authority and serves as the chairman of the Authority’s Capital Development Committee. Wagner is chairman of the Greater Oak Brook Chamber of Commerce and is also a trustee for The Conservation Foundation. As a member of the International Council of Shopping Centers, Wagner has been a significant advocate for the Marketplace Fairness Act. He is also a member of the Investment Program Association’s Public Affairs Committee and part of the Real Estate Roundtable’s 1031 Like-Kind Exchange Coalition. He is a board member for the Civic Federation of Chicago and active in the Illinois Chamber of Commerce, Illinois Manufacturers Association, Illinois Retail Merchants Association and the United States Chamber of Commerce. Greater Oak Brook Chamber of Commerce Award Nomination time is here! 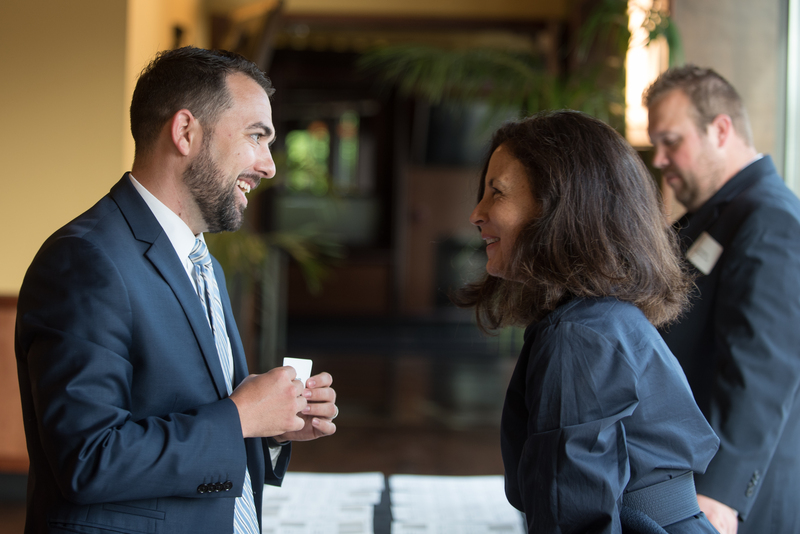 The Champion for Young Professionals award recognizes an organization with superior model leadership and achievements in attracting and retaining talented young professionals. 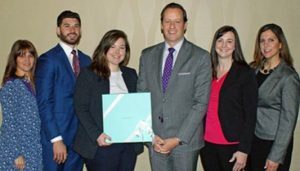 In 2017 this award was presented to Northwestern Mutual-Chicago/Oak Brook, an organization that strongly encourages both formal and informal mentoring of its professionals. 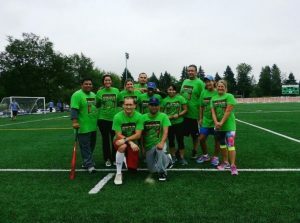 They have received the National Team award for 6 years for its recruits and their productivity, and its employee retention rate is THREE times the industry average. It is no surprise they have been honored with Crain’s Best Workplace award for the past 6 years. We recently asked Northwestern Mutual-Chicago/Oak Brook what the award meant to them: “We were honored to receive this award because it speaks to our core mission to attract and develop highly motivated individuals committed to building a financial services practice,” said Chad M. McQuade, J.D., CLU® managing director. 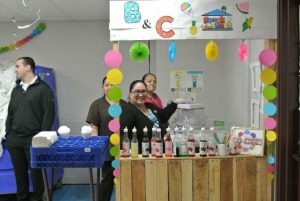 “We are proud of the culture in which our team members understand their work is meaningful, and they can make an impact in their clients’ lives and their communities,” he added. Do you know a company that would be a great nominee for this award? Please click here to nominate a chamber member company for this award or contact Tamryn Hennessy thennessy@obchamber.com with any questions. Nominations are due December 31, 2017 and will be awarded at the Greater Oak Brook Chamber Annual Meeting on March 20, 2018.